About a week ago, I was looking over the models (the January 15th 18Z GFS run to be exact) and started getting excited about a deep trough looking to plow through the southwest. The week prior would involve multiple systems slowly making it further south along the coast as they came onshore. That model run showed ample Gulf moisture combining with Pacific moisture on the Eastern Plains (Colorado). I was laughing at myself as I often laugh at others when they get excited about such things that far out. Still, though, I watched as the days passed. I tried to mobilize others to get excited about it but couldn't garner much interest. 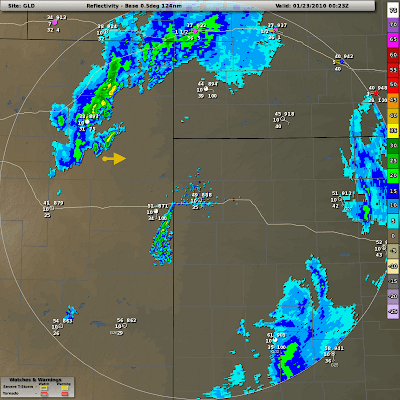 The runs stayed fairly consistent and I figured that we'd get a round of convection out on the plains. 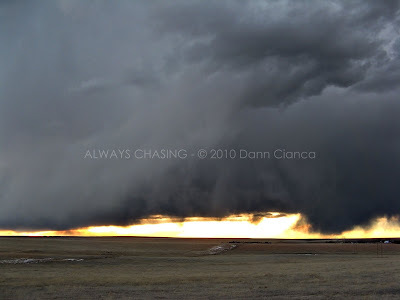 I was hoping for a cold core tornado event, but as the days passed, it was clear that it would not pan out. Over the week prior, I started obsessing, as I tend to do. Facebook was filled with myriad posts with 'SDS' in them but I realized I had something much more terrible. I call it Obsessive Convective Disorder or OCD. I believe that played a large part in my decision to go into work at 5AM on Friday so that I could leave at 1 and be out on the plains if need be. Okay, so "need be" is rather weak in this case, as I had pretty much decided already that I was going to go anyway. The WRF 4.0km precip model helped my decision along as it broke out convection along the Footies in the early afternoon and then more in NE Colorado after dark (shown below). I had been analyzing soundings as well which showed CAPE from 750mb to about 650-600mb in the order of about 100-300J/kg. From the soundings (which I neglected to save), it appeared as if the storms would be elevated and low-topped (the latter certainly expected in January). I left work at one and was home a little after 1:30. I spent time time pouring over the latest RUC runs and praying to get a little more moisture going. By 2:45, I was ready to hit the road. Though my tank was three quarters full, I decided to top off. For whatever reason, I decided to look east... and saw apocalyptic towering cumulus. My jaw dropped. Suddenly, I was in a big hurry and it didn't help that traffic kind of sucked on I-225. Winds in the metro area were coming down off the mountains. Where the westerlies met the more southerlies, a weak moisture discontinuity set off the line of towers. 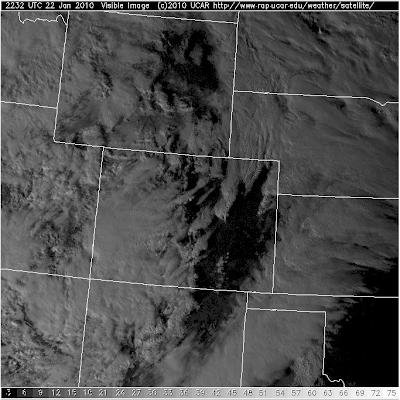 Call it a modified Denver Cyclone if you will as there was quite a bit of wrap-around. Finally east of the city, I watched a couple of towers go up and glaciate out. 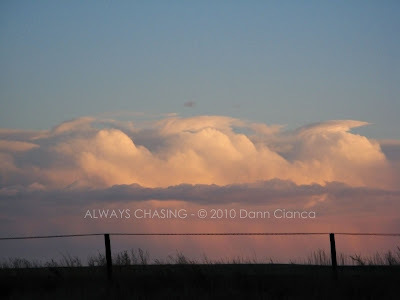 Some mid level cumulus formed up in the turbulence behind the line and I took a moment to grab a picture. On radar it was nothing too exciting, but it definitely looked good for January in Colorado! 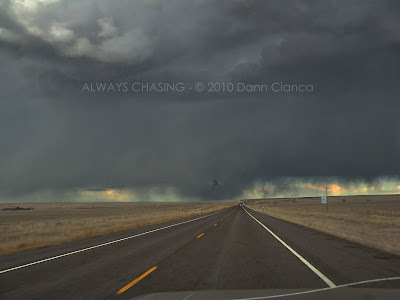 Eventually I caught up with the line on US36 and punched through with only a moderate shower. The air at the surface was pretty dry and the rain coming out of the base evaporated pretty substantially near the ground. The Pacific moisture advecting in helped keep the mid levels saturated, however. ... so I decided to get further out ahead of the line to get a better perspective. I pulled off 36 just east of Lindon near a big tower and found a little road into the pasture that was unfenced. I drove 200 yards to the south and found a nice overlook. Radar was showing that the "storm" on the tail end was producing lightning so I had a look at it. I had put a fresh battery in my Kestrel3500 so I was damned if I wasn't going to use it! Though I was on the east side of the line, the wind was still out of the southwest and it was cold! I took a reading and found it to be 50 over 26 which wasn't overly impressive. So I headed east toward the "better moisture". Tony at the time texted me, joking about "the dryline". 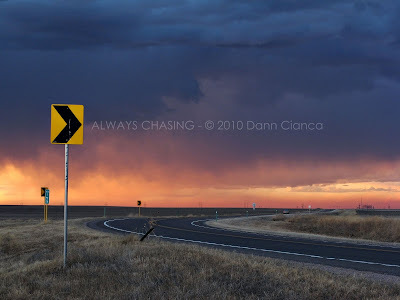 As light was fading, so were the storms behind me, so I stopped three miles southeast of Anton to capture the fading light and decide what to do. 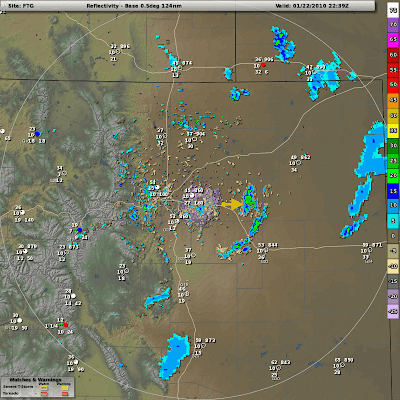 Remembering that the WRF was breaking out more precip in NE Colorado at 0Z-1Z, I decided to continue east. 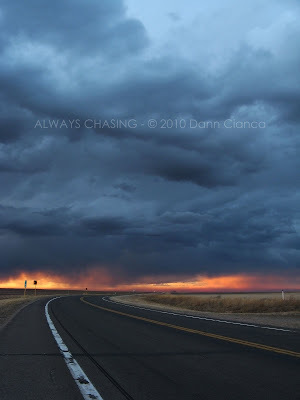 No sooner had I gotten back on the road, when I looked north and saw a thick tower sprouting through the mid level cloud deck and already beginning to flatten against the equilibrium layer. I looked over at the radar and suddenly a C2G erupted from the cloud base. I felt rather giddy. 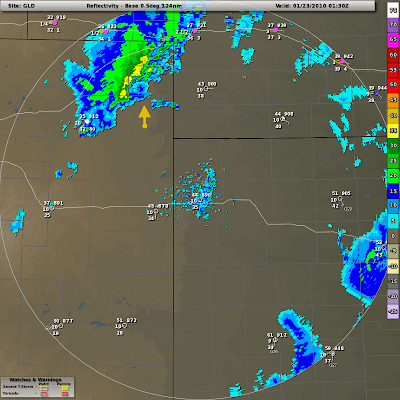 I also noticed, however, that a line of convection was forming near Goodland. But... 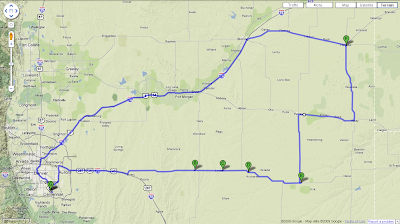 I decided to stick with my initial target and continue north and east. When I finally turned north on Colorado 59, the light show really began. 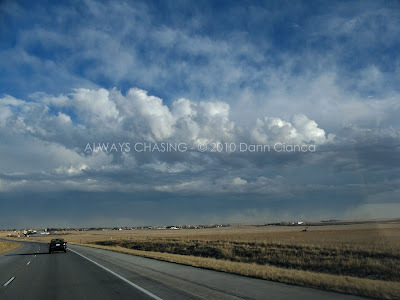 I saw a few more C2Gs and many flashes from the convection to the north. I was going to stop in Yuma and take some photos, but as I arrived, the lightning died down. More convection was building to the NE, so I continued east to Wray and then headed north again. My plan was to get to Holyoke and try and get some lightning shots before heading home, but the lightning never really manifested itself again such that I was able to really have an opportunity to capture it. In Holyoke, I reached the rain. The drops were large and contained ice but nothing large enough to bounce. They were basically huge slushballs. I refueled and began the journey home. The rain became heavy a couple of times just west of town but slowly gave way to thick fog. 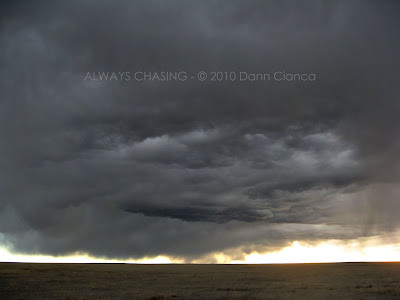 Near Fleming, I did actually call into the local weather service in Boulder, but only to report fog of a quarter mile or less. Not quite the report I was hoping for that day, but I figured I'd give the mets a heads up. Winds were strong (20-25kts) out of the NW at time and blowing the fog in waves. It was kind of cool. 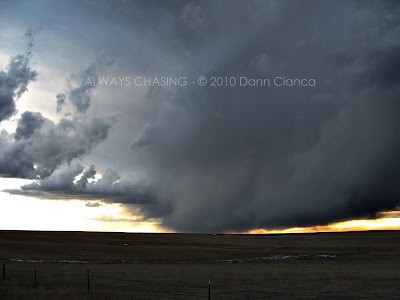 I was obviously now behind the surface low which was really undergoing genesis before heading out onto the plains. I was home before 11PM, which wasn't bad! In all honestly, it felt fantastic to get out, feel the rain and see some lightning. Exploder performed well in the melting permafrost and in the rain as well. I'm loving my new tires! Plus, it was nice to give her a little baptism in the rain and wash some of that Midwestern salt I got on her back on January 3rd. I wasn't disappointed with the results. The only downside of the night was although Sploder got about 17.5mpg (which is good for her! ), I spent over $60 in gas. I pretty much ignored how much I was spending in gas last year which didn't work out so well in the long run, so I'm trying to be very attentive to that this year. 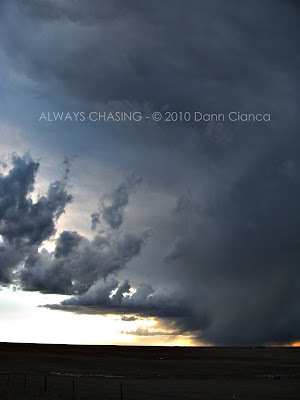 *Sigh* Looks like that will necessitate multiple chase partners! Not bad for January! I saw a few of those towers popping up out E around 3pm as I was going to work. They flattened as you mentioned but still good to see. Glad you were able to get out there. My usual chase partner just got evicted so I'm gonna have ample space in my car anytime you want to head out. Good job! Nice pix Dan. Your photography is exponentially progressing. Even though Im an hour north, FB or email me anytime this spring/summer about heading out east! Nice pics Dann, I agree it would appear your photo skills are progressing! 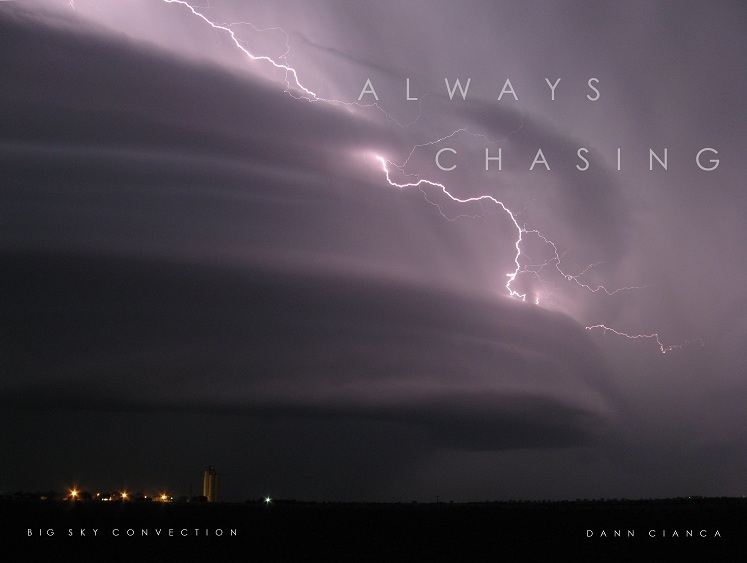 You going to ChaserCon? Thanks for keeping us eskimos entertained with some footie magic again this year. Scott: Thanks! They were pretty atomic for January, eh!? What do you mean about your chase partner getting evicted? Like evicted from their home or from their seat as your copilot? Sean: Thanks, I'll be in touch man. Do you have a phone number yet? Chris: Thanks man! I'll be there.